The Kifu Paris small propeller uplight floor lamp in cream shagreen is a sculptural lighting piece and comes in two other sizes sold separately (images at end of slide). The finish of the shagreen is authentic as it is hand-dyed and the designer calls the finish look: "antique natural shagreen." The luxurious metal shade creates beautiful shadows once lit and is removable. Group all sizes together to create a dramatic statement in your space. This piece is designed by the daughter of Ria and Yiouri Augousti. The dimensions of this piece are 40 x 40 x 82.5 cm / 15.75" x 15.75" x 32.6" All Kifu Paris pieces are handmade by artisans, ultimately making each piece unique. 1 piece currently available for immediate shipment, multiples available on order with a 5-6 week leadtime, custom color/sizing available on request. Wipe clean with soft dry cloth. Although inspired by her parents, her collection of Home Accessories and Furniture is a distinct identity of its own. Kifu uses handmade techniques of elaborate inlay patterns of shagreen, shells, semi-precious stones, materials she experienced as a child growing up in her parent’s studio, but interpreted in a younger quirkier way reflecting her youth. From her "jewelry inspired knobs" on decorative boxes, gold bar boxes and an extravagant inlay pattern mix of shagreen and shell inspired by galactic constellations, as seen on her enormous round mirror, is refreshing to see. Kifu embodies whimsical elements throughout her collection and is not afraid to be daring and unexpected in her approach to design. All shagreen-covered items should be kept out of direct sunlight, color variants may occur on the stingray and other exotic finishes, but this showcases the Parisian label's commitment to creating authentic luxurious products using natural components. Champlevé bronze and brass Hand-sculpted Signed by Allan Beagle Dimensions: 81 x 20 x 18 cm. 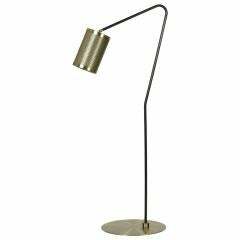 Elegant adjustable floor lamp in brass and wood from the 1950s. Measures: Height 160 cm. Maximum width 75 cm. Diameter shade 48 cm. Diameter base 34 cm. 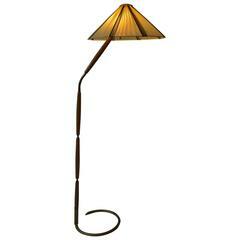 Floor lamp with two spotlights in cork and brass. Italy, 1970s. Measures: Height 154 cm. Diamater base 26 cm. Spotlights in 32 cm. Spotlights out 58 cm. Two E27 bulbs.